The Porsche customer team Precote Herberth Motorsport has taken a big step closer to claiming the title of the ADAC GT Masters. Scoring second at the penultimate race of the season, Robert Renauer and Porsche Young Professional Mathieu Jaminet have extended their lead in the championship by ten points. On the Hockenheimring Baden-Württemberg, Timo Bernhard and Kévin Estre from KÜS Team75 Bernhard finished ninth after a courageous pursuit race in their ca. 500 hp Porsche 911 GT3 R. The newcomer team IronForce by Ring Police came third in the trophy category for amateur drivers. The No. 17 customer sport racer fielded by the KÜS Team75 Bernhard squad put in a spirited charge through the field. An accident in qualifying threw the German Porsche works driver Bernhard down the grid to position 34. In the race, the two-time Le Mans overall winner resolutely worked his way up the field. By the time he handed the 911 GT3 R off to his teammate after 15 laps, he had gained 21 positions. His teammate Estre (France) continued the hot pursuit and crossed the finish line in ninth place. “As I accelerated out of the pit lane during qualifying, I swerved to avoid a vehicle part lying on the track and lost the rear of the car with the wheelspin. The race was a good compensation for our fans and the teams. Our goal on Sunday is definitely to finish on the podium,” explained Bernhard. The second 911 GT3 R fielded by the team from Rhineland-Palatinate narrowly missed out on scoring points. Start driver Adrien de Leener took up the penultimate race of the season from P23 after encountering two red phases and heavy traffic. In the race, the Belgian worked his way up to 16th. After 13 laps, de Leener headed into the pits and handed the car off to Klaus Bachler (Austria). The former Porsche Junior made up more positions and took the chequered flag in twelfth. “After the qualifying we knew that we’d have to take care at the start, because things get pretty tight in the back third of the field. In the first corner I had to avoid several cars. Unfortunately, another car blocked us when we pitted for the driver change and we lost time,” said de Leener. The customer team IronForce by Ring Police occupied 26th place in the overall classification. Start driver Jan-Erik Slooten took up the penultimate race from P30 and made up one position during his stint. After 13 laps, the German handed the car off to Lucas Luhr. The long-serving former Porsche works driver from Germany gained three more positions over the remaining 22 laps. The team, supported by the popular YouTuber Jean Pierre “JP” Kraemer, scored third in the trophy class for amateur drivers. “At the start there were several collisions in front of me, which cost me several places. We had a problem early on with the ABS, and that made it difficult to catch up. We were very happy with the speed of the 911 GT3 R in the race – that put us in the top ten,” said Slooten. “That was a successful day for the Porsche customer teams. Herberth Precote Motorsport performed brilliantly in qualifying and with second place they could extend their lead in the championship. The other racing squads experienced a bit of bad luck in qualifying but did well in the race. Timo Bernhard and Kévin Estre in the No. 17 Porsche 911 GT3 R put in a strong drive. The championship is very close. 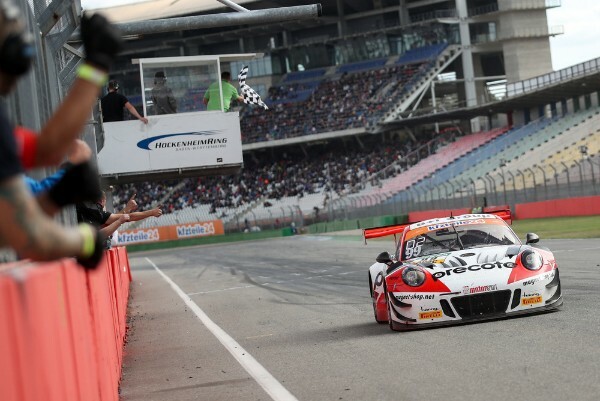 We’re looking forward to the final race and we’re hoping for a good conclusion to the season for Porsche,” said Marc Lieb, Head of Customer Racing. Round 14 of the ADAC GT Masters takes off on Sunday 23 September at 13.05 hours.